Heh. That last panel is from right here in Seattle, down by Pike Place Market. Have I mentioned I’m going to be in Minneapolis July 5th-8th for Convergence Sci-Fi Con? I will be. And it’s coming up in a couple weeks. Find me on panels and at my table in the Dealer’s Room. Not much has happened since Monday. Played racquetball, which continues to be great fun (I fear if we ever think about learning the rules or keeping score), made bread, made kale chips. The usual. So, um, follow the Spacetrawler Tri-directive: spread links about how awesome the comic is, buy books, and most of all — enjoying reading! Kidnapping and deadly situations tend to be bring out the defining qualities of the brave and the bold. Unless applied to Dustin. The panhandlers where I live just try and predict my dogs pooping habits. Rarely do they recruit me for anything. @Liadon, I saw that and didn’t have a chance to change it before posting. Honest, it’s what the dang fence looks like! but I changed it, you’re right, too distracting. Was going to complain about how contracted the rings of Saturn look, but then I realized that it’s hard to get such an ethereal look with such a solid style. Then again, looking at the Cassini images, I’d say the rings are quite close to being as far as the diameter of the planet to either side. So I guess I am sticking to my original complaint, after all. I do love Mr. Zorilla’s quick quips. Uhm, do you allow speculations in the comments? So are Emily and Pierrot going to have to go out on the hull in pressure suits to fight these critters? Those critters are red, so a blue laser oughtta do the trick. 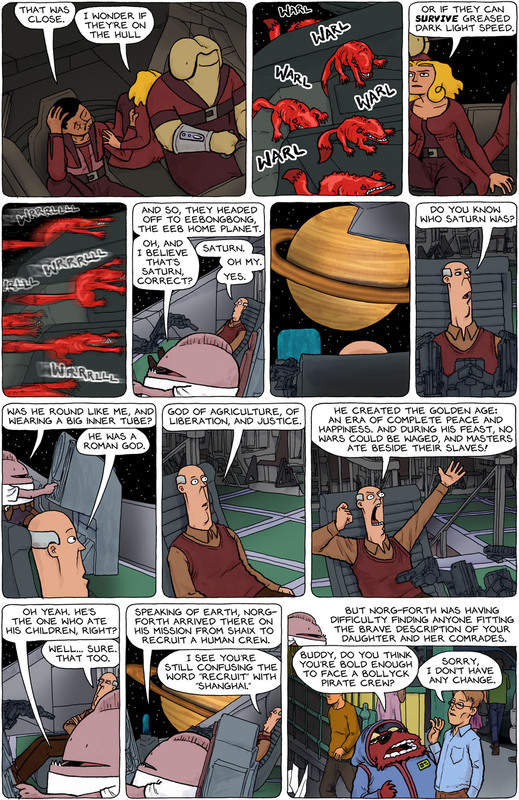 In panel 5, I thought he was saying that Saturn was the ebb home world. Figured it out by panel 6, though. @Coyote, I beg to differ. I think this experience has DEFINITELY brought out Dustin’s defining qualities. Norg-forth is trying his best, but he’s no great Shaix. To be fair to Saturn, the Romans conflated the Greek gods with their own preexisting myths. So Saturn probably didn’t start out as having eaten his children. Yep, Getting Dustin’s brother Bill on board would be wonderful – either that or Chuck Norris. Perhaps we could find out that Elvis, who lives in secrecy in his paradise of burgers and collesterol, is in fact interested in helping out. … wonderful as it is to find elvi in the wild, I cant see them being seen in this webcomic. there are never enough men in small sequened capes in webcomics today. It’s a massive lacking for our culture and we will be poorer for it. LOL it was funny, so Saturn was Roman God, interesting….